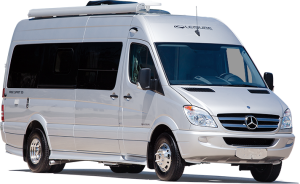 Triple E RV has made history in the RV industry with their Class B Free Spirit Leisure van. The 2013 Free Spirit SS is the industry’s very first Class B van that has a front living area slideout. It also has a unique three-piece, self-contained bathroom. There is lots of room in this van built on a MercedezBenz 3500 Sprinter Van, with dual rear wheels and a 170″ wheelbase, and a powerful 3 Liter V6 CDI Blue Tec Turbo Diesel 188 hp w/ Mercedes 5 Speed Auto Transmission engine. The cab features captain chairs that are ultra-leather with swing bases, cruise control and a tilt steering wheel. Remote locks and power windows add to the convenience of this Class B leisure van. Amenities for the Free Spirit SS include a galley with a 3-way, 4.5 cu. ft. refrigerator/ freezer, Corian countertops, sink and stove covers and a microwave/conventional oven. A sofa converts to a U-shaped table, and a built-in rear 22″ LED TV on swing arm c/w Antenna offers entertainment. With an optional rear powered sofa sleeper that converts to a queen bed, it sleeps 2 comfortably. The stylish, full body exterior paint, high quality interior furnishings and solid wood cabinetry give the Free Spirit a beautiful interior that emits a classy look and layout. Adding to those details the fact that Triple E RV continues to be popular with owners, this may be a manufacturer you want to consider.